Stop motion is the technique of shooting single frames of an inanimate object while moving it a tiny bit in each subsequent shot. The effect results in making the object appear as if it’s moving when on film. The first example is The Humpty Dumpty Circus made in 1897 by Albert E. Smith and J. Stuart Blackton which made a toy circus appear to come to life. Often, the technique is used in film to add atmosphere or special effects to a scene. Star Wars Episode IV: A New Hope features stop motion animation when Luke Skywalker plays a futuristic board game of chess against Chewbacca. Later in the series, stop motion is used in The Empire Strikes Back to make giant canine-looking AT-AT tanks walk across a frozen wasteland and in The Return of the Jedi when Luke fights off a giant rancor in Jabba the Hutt’s lair. Stephen Spielberg used the technique to animate his alien spaceships in Batteries Not Included (1987) while The Terminator (1984) used stop motion to great effect particularly when Arnold Schwarzenegger’s cyborg character removes its own damaged eyeball using nothing but a knife. LAIKA began life as Will Vinton Studios in 1978. Will Vinton started the animation studio in Portland, Oregon to produce special effects for movie and television, eventually releasing a stop motion feature film called The Adventures of Mark Twain in 1985 inspired by the life and work of the famous author. Will Vinton Studio’s work became renowned in the late 1980s with a variety of television commercials including the California Raisins, Domino’s Pizza’s “Avoid the Noid” campaign, and the M&M’s animated Red, Yellow, Blue, Green, and Orange characters (although the M&Ms have been computer animated for years now). The studio also produced the FOX television animated series The PJs starring Eddie Murphy in the 1990s. In an effort to fund additional feature projects, Vinton took on outside investors including Phil Knight, founder of shoe company Nike. Inc., and Phil’s son Travis, who worked at the studio as an animator. In 2002, Knight became the majority shareholder of Vinton’s studio with Vinton being dismissed. In 2005, Laika Entertainment (now LAIKA) was founded. LAIKA is named after the Russian space dog, Laika, who became one of the first animals in space in 1957 and was the first animal to orbit the Earth. Sadly, since the technology to retrieve a space vehicle from orbit had not been developed at the time, Laika’s survival was never expected. Some scientists even believed humans wouldn’t survive launch or the harsh conditions of space, which is why animals were used to test the equipment prior to manned spaceflight. LAIKA is still based in the Portland area today with its headquarters located in Hillsboro. LAIKA’s first feature length film, Coraline, was released in 2006 and received a Golden Globe Award nomination for Best Animated Feature Film and an Academy Award nomination for Best Animated Feature. The film’s lead character, Coraline Jones, moves to a new home and finds a secret door leading to a fantasy world. A variety of truly bizarre characters and unique perspectives makes the film a fascinating look at the capabilities of stop motion, but also prevented the film from reaching significant mainstream success. LAIKA’s second feature, ParaNorman, received much more mainstream success featuring a character, Norman, who possesses the ability to see and interact with the dead around him. He eventually has to work with his friends to prevent zombies and the undead from attempting to take over his town thanks to a centuries-old curse. LAIKA’s third film, The Boxtrolls, is based on author Alan Snow’s fantasy-adventure book series, The Ratbridge Chronicles, specifically the first book Here Be Monsters! Once again, the film received Golden Globe Award and Academy Award nominations for Best Animated Feature Film, however it wasn’t spectacular successful in the box office. LAIKA’s fourth film, Kubo and the Two Strings, received two nominations at the Academy Awards – Best Animated Feature and Best Visual Effects (the second animated film in history to receive a nomination in the category after The Nightmare Before Christmas) and a nomination for Best Animated Feature at the Golden Globes. Kubo, a young one-eyed boy with the power to play music which animates objects and a mom gripped with memory loss, goes on a wild adventure when two mysterious witches attempt to kidnap him. The film features the voice work of famous actors Charlize Theron and Matthew McConaughey as well as a cameo by George Takei. 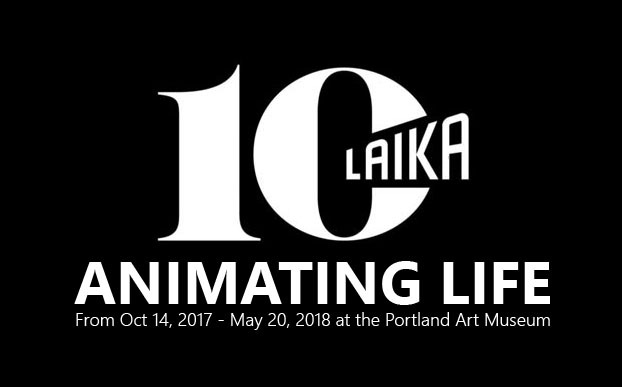 In celebration of more than a decade of stop motion film-making, LAIKA teamed up with the Portland Art Museum to present the Animating Life exhibit which opened on Saturday, October 14, 2017 and will run through Sunday, May 20, 2018. Throughout the exhibition, the Northwest Film Center will present programming showcasing LAIKA’s work and looking at the evolution of stop-motion animation beginning in the late 1890s. The Portland Art Museum is located 1219 SW Park Avenue, Portland, OR 97205 and is opened Tuesday through Sunday at 10 a.m. closing at 5 p.m. except for Thursday and Friday when it’s open until 8 p.m. Admission is $19.99 for adults, $16.99 for seniors 62+ and college students, and free for children 17 and under. For more information and to buy ticket’s online, visit the Portland Art Museum’s Animating Life website by clicking here. What Portland art scenes do you love? Do you love Portland’s artistic endeavors as much as we do? Share your favorite Stumptown creative inspirations in the comments!